I digress from my usual topic on this blog, to comment on something which has been rubbing me the wrong way during this whole week. Namely, I want to talk about one of the titles of DCs "New 52" line and the massive outcry against it. I'm talking about Catwoman. Ever since the release of the number 1 issue of said line last week, self-appointed internet crusaders have been up in arms against it and the perceived sexism with which the character is treated. 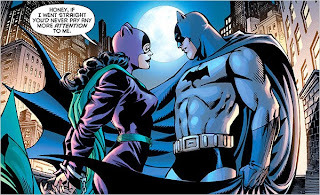 Now, I would understand if female readers would take offense on some titles of the new lineup („Voodoo“, "Wonder Woman" and - especially - "Red Hood and the Outlaws" leave a lot to be desired in the area of strong female characters), its just that I can't wrap my head around the idea of Catwoman suddenly taking the heat for this.